Passive Intermodulation distortion (PIM) — the nonlinear effects that are observed from the passive components (i.e. antennas, cables, connectors, power dividers, and mixers) of a system at high signal levels — is a phenomena of particular relevance in wireless infrastructures dedicated to the propagation of vast amounts of traffic. Cellular and satellite networks are such systems as they require high powers with increasingly sensitive receivers in extremely narrow bandwidths. For instance, the increase in the number of carriers and their respective power levels in communications satellites run the risk of a severe functional degradation due to PIM. These nonlinear effects manifest as Intermodulation Distortion (IMD) products and, while the signals generated are usually relatively low, they can create severe interference problems in highly sensitive systems. In these multicarrier networks, two signals with the same transmission path that are relatively close in frequency can mix together, generating PIM. PIM products also differ greatly from active IMD since they cannot be filtered out and behave relatively unpredictably — they are often influenced by external factors such as temperature and time variations. This often leads to the need to suppress PIM at the manufacturing stage. While there are a variety of sources that cause PIM, the two major contributors are the integrity of the contact and integrity of the material. 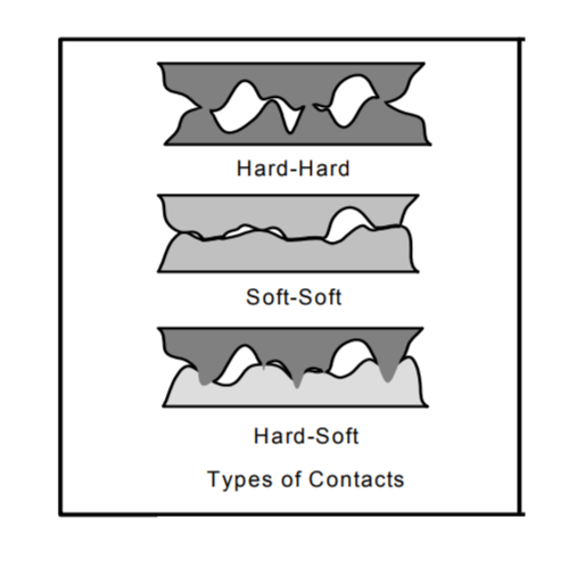 The integrity of the contact can be defined by the loose connections on metal-to-metal (MM) surfaces either from loose mechanical connections or, more specifically, from micro-discontinuities in the MM junctions. The integrity of the material mainly refers to the ferromagnetic materials that are often employed in the cable assemblies, including iron, nickel, cobalt, and alloys that include these materials. 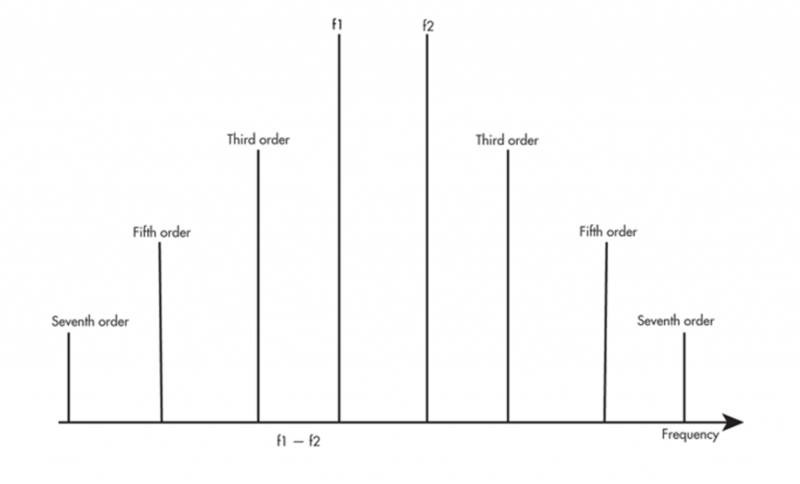 As depicted in Figure 1, the IM products that most notably cause interference are third order (IM3) as they often fall into the receive band. The PIM phenomena has been heavily researched and modeled in recent years as over-the-air congestion is only expected to increase, thereby tightening the requirements in wireless systems. PIM cannot be filtered out the same way that IMD is with active devices because the passive “hardware” is used prolifically in both the transmit and receive signal chains. In other words, it would be difficult if not impossible to filter out PIM without removing the original carriers. Smart band planning methods mitigate the negative effects of PIM and are designed so that the receiving band and higher order PIM products fall into the same frequencies. That way, the lower amplitude (higher order) PIM falls into the noise of the receiver. However, this solution does not apply to all systems, especially in situations that are extremely bandwidth restrictive. Also, the increasingly high powered carriers yield higher powered PIM products that might not necessarily fall below the noise floor of a receiver. Frequency hopping schemes have also been introduced that allocate the receive band such that the high amplitude lower order PIM products are prevented from negatively affecting the receiver . These methods require a fast and effective way to count intermodulation products (IMP) and are once again, not really suitable for all systems. 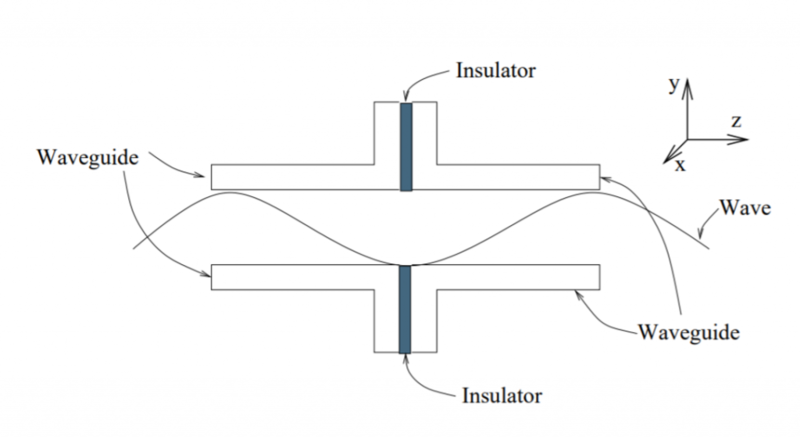 The thickness of this dielectric layer depends upon the type of metal utilized in the connector head or waveguide (Figure 2). Numerous studies have been introduced that show a reduction in PIM from a decreased contact resistance -. This may not be surprising considering the nature of metals — there is a marked improvement in the microscopic configuration of a mating under high mechanical load depending on the hardness of the metal used. Moreover, corrosion and aging contribute to damaging the integrity of the MM connections as this naturally thickens the non-conductive layer, preventing a conformal microscopic mate. There is an observed increase in PIM instability at low loads that improves with a little tightening. This varies depending upon the metal; softer metals such as gold or silver require a relatively low load to break up the thin native insulating layer on each surface, bringing the PIM levels below the noise floor. Harder metals such as brass or stainless steel will often exhibit higher PIM levels than the more malleable metals even after reaching the pressure necessary to reach a threshold where there is stability in the PIM response. This has been attributed to the inability to disrupt the insulating layer between the MM contact surfaces. It is therefore critical to maintain a high pressured connection where hard metals such as brass or steel are used, whereas a clean mating surface is of higher importance in cases where the softer silver or gold (plating) metals are employed to remove contaminants. The best PIM reduction was found by mating soft metals such as gold or silver with hard metals such as steel or ferrites . This is due to the fact that the most linear mating can be accomplished on the microscopic scale, leading to a potentially simple solution for PIM suppression by the careful selection of connector materials (Figure 3). While this technique is elegantly straightforward, it does come with some considerations. A tight fitting is not necessarily feasible in some environments; base stations and outdoor DAS can be subject to constant vibrations and the rigid direct contact can actually deform the threading, potentially preventing future maintenance. Moreover, the harder metal materials are often ferromagnetic, which is known to be a source of PIM in and of itself. Some connector designs include a dielectric sheet that is placed between the MM junction points, which instead forms a parallel-plate capacitive element. The impedance can be kept low (< 1 ohm) by adjusting two factors: the dielectric constant of the material and the spacing between the two metal surfaces . This absence of continuous direct contact potentially limits the generation points for PIM. Another apparent benefit is the fact that various conductive surfaces can be used without running the risk of galvanic corrosion — an electrochemical reaction that occurs at the junction of two dissimilar metals in the presence of an electrolyte. Still, the dielectric separation does not necessarily allow components to maintain linear performance with environmental agitators that cause aging and corrosion to both the dielectric material and metal surfaces. 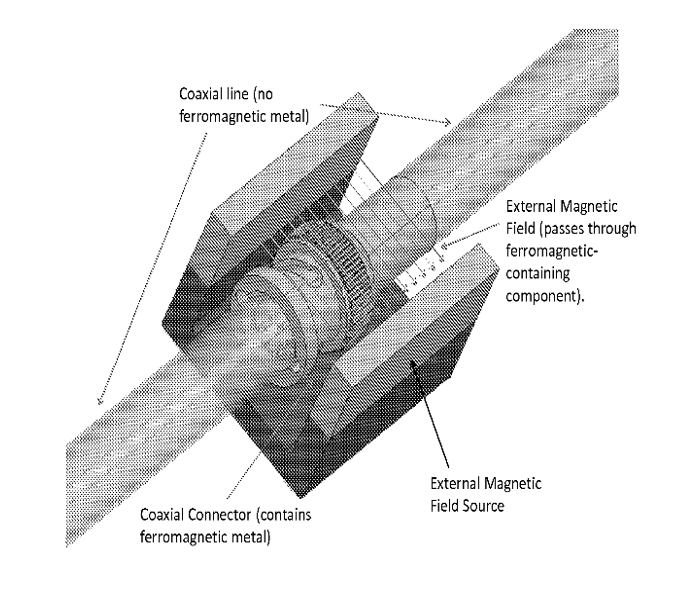 Ferromagnetic materials that are often used in RF connectors due to their cost-effectiveness and ease to manufacture such as nickel or steel have been known to generate PIM. This occurs due to hysteresis — a phenomena that takes place when an external alternating magnetic field is applied to demagnetized ferromagnetic material, eventually irreversibly magnetizing it. One method of mitigating this spurious signal generation is by biasing the ferromagnetic materials with a static magnetic field through the carefully calculated placement of magnets -. Another method is to design low PIM connectors through the careful selection of base and plating materials. Silver- or gold-plated contacts are often found without the nickel or ferromagnetic undercoating. One method of PIM suppression uses circuitry within the wireless communications node, estimates the PIM interference coupled into the node’s receive path and then cancels the estimated interference . In this design, the coefficients needed for the predictive modeling are determined through a test signal through the transmit path and an analysis circuit measures any interference into the receive path and further refines the coefficients. The estimation circuit uses all the information to predict PIM interference in later transmissions and feeds the data to the cancellation circuit which, in turn, attempts to cancel out the PIM. Naturally, this method relies heavily on PIM modeling and since PIM is unpredictable, the system will need regular upgrades and maintenance. The PIM phenomena has become an increasingly studied topic in the past decade since it can significantly degrade the performance of a wireless communications system and is hard to model, test, and troubleshoot for. There are many instances where PIM can occur; in cellular networks, PIM is generated in setups that allow for multiple service providers to share an existing feeder cable. In direct broadcast satellites (DBS) where transmit and receive functions are combined into one antenna such as the high power Ku-band antennas on the Intelsat VII. As both satellite and cellular systems have increasingly tighter band restrictions with higher power density requirements, PIM is necessary to suppress. Although there is potential, external cancellation circuitry composed of distributed elements or even external magnets on the communication system may not be feasible or even effective, depending upon the circumstance. Moreover, the dynamic and unpredictable nature of PIM does not allow for a universal solution. Special manufacturing processes for low PIM components are essential for effectively suppressing PIM in high risk systems, along with the careful tightening and soldering of joints. Every MM contact point has the potential to generate PIM and must therefore be assessed during the manufacturing process as well as during the installation, instead of after there is a performance issue. 1. C. Vicente and H. L. Hartnagel, “Passive-Intermodulation Analysis Between Rough Rectangular Waveguide Flanges,” in IEEE Transactions on Microwave Theory and Techniques, vol. 53, no. 8, pp. 2515-2525, Aug. 2005. 2. M. Bayrak and F. A. Benson, “Intermodulation Products from Nonlinearities in Transmission Lines and Connectors at Microwave Frequencies,” Proceedings of IEEE, vol. 122, pp. 361–367, April 1975. 3. F. Arazm and F. A. Benson, “Nonlinearities in Metal Contacts at Microwave Frequencies,” IEEE Transactions of Electromagnetic Compatibility, vol. 3, pp. 142–149, August 1980. 4. Yong Gao, En Li, Hu Zheng, Gaofeng Guo and Yunpeng Zhang, “Effect of Contact Resistance of Passive Intermodulation Distortion in Microstrip Lines,” 2016 IEEE MTT-S International Microwave Workshop Series on Advanced Materials and Processes for RF and THz Applications (IMWS-AMP), Chengdu, pp. 1-3 2016. 6. M. Runde, “Mass Transport in Stationary Contact Points,” in IEEE Transactions on Components, Hybrids, and Manufacturing Technology, vol. 10, no. 1, pp. 89-99, Mar 1987. 9. Hanwook Jung and O. K. Tonguz, “Random Spacing Channel Assignment to Reduce the Nonlinear Intermodulation Distortion in Cellular Mobile Communications,” in IEEE Transactions on Vehicular Technology, vol. 48, no. 5, pp. 1666-1675, Sep 1999. 11. Henrie, Justin & Christianson, Andrew & J Chappell, William. “Passive Intermodulation Distortion in Microwave Networks From Coaxial Connectors.” (2018).